Emboldened by encouraging words (and detailed instructions) from accomplished printmaker Paul Furneaux (who sizes his own paper) I decided to give it another go. I'm using his Winter recipe; 14grams of animal-skin glue (rabbit) and 5 g of powdered alum to 1L of water. I soaked the glue in 1/2 the water overnight, then added another 1/2 liter of boiling water in the morning, stirred it all up (it dissolved nicely) then turned up the heat and added the small amount of alum, that I had already dissolved in a small cup of very hot water. I kept all this on a warm stove/flame in a make-shift double boiler to keep the glue mixture from getting too hot. The interesting advice I got from Paul was to use an old blanket under my work station to act as a size catcher--and to move the brush slowly across the width saturating the paper with warm size (it will soak thru to the blanket). 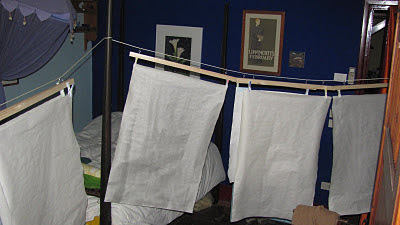 He doesn't stack it but then picks it up carefully and hangs it up to dry sheet by sheet. He urged to leave the last few centimeters unsized so as to have a dry, strong edge to lift it up. I'm trying to size a fairly thin paper but that was available down the street at the local art-supply store and was practically the heaviest they had, the rest of their stock is used by bookbinders and for restoration work. It is a handmade Japanese washi, 45g/M2 weight and 90%Kozo(mulberry) and 10% wood pulp. Here's the table. Blanket is down, sheet of paper on top, smooth side of the paper (the printing side) is UP and will receive the size brushed out. 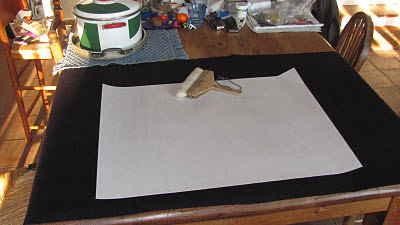 This paper is strong enough that I didn't need to leave the unprimed edge. The one sheet I sized right to the edge was just as easy to handle and didn't tear. This paper is pretty thin and I got some buckling where my thumb was used to hold it down to allow the brush to go over the paper. Extreme care has to be taken to try to get the edges of the strokes almost touching as if they overlap and xtra layer of size goes down. A bigger brush would be good. I thought of buying 2-3 of these and making a jig to hold them all together so they'd function as one big brush....but I decided to wait and see how these trials go. Hung up they looked smooth and pretty good. There were some areas of skipped or double size but not too bad but in my Winter climate the rooms are all very dry and trying to place them in the one unheated room with the windows open (Damper outside than inside) still caused the paper to dry too quickly--they were dry to the touch in 30-40 minutes. And I think the slight puckering/unevenness is due to the drying. But this is much better than my first try and I think all the paper is useable. The professionally sized paper I've been able to buy online still looks better and more uniform than these sheets that I've managed to produce at home. But this is much better than my last try so there's hope? I need to let it rest/cure for a few days before I print on it. The paper is still hanging in the room to rest/age/cure/loosen up. It feels stiffer and has more body than it did unsized. I sized BOTH sides of one sheet and will pull a few proofs of a small print from each of these trials later this week and I'll post pics of those once they're done. Wow. Kudos to you Andrew Stone. Nice work. Great job! I've only tried sizing a couple of times and it went ok, the sheets weren't as nice looking initally as professionally done ones but once I himidified and printed them they flattened perfectly and I had good results in terms of ink pick up and not bleeding, etc. I used Walter Phillips recipe. I did find it easier to size smaller sheets, I cut the paper down to a couple inches bigger than my finished image and then sized them - handling was easier, they seemed more robust, and I didn't struggle with overlap and gaps as much. I didn't hang to dry (I don't have room or a place to set that up) I just laid them on newsprint and it seemed ok. I have a few prints coming up where blotchy printing/uneven size will be a plus hence my trying it now--I also am saving my GOOD paper for ....a rainy day? If I could manage to slow the drying time I'm pretty sure the results would be much better as the kind of buckling and curling of the edges is related more to the quick drying than the uneven size. 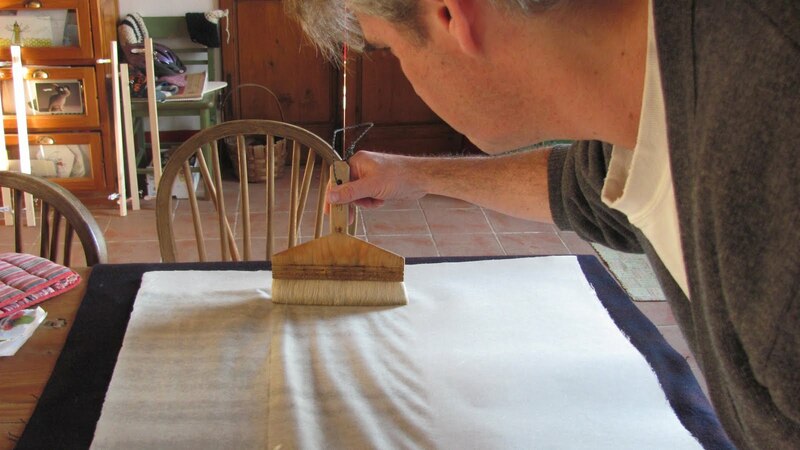 That and being able to pull the brush across in just one stroke (smaller sheet or bigger brush) would too. I'll try and find the actual name of this paper so those who've tried it before can chime in. Printing trials will show me instead if there is too much alum (pigment wont stick to paper) or it is just too irregular (uneven printing where a smooth color is wanted/printed). 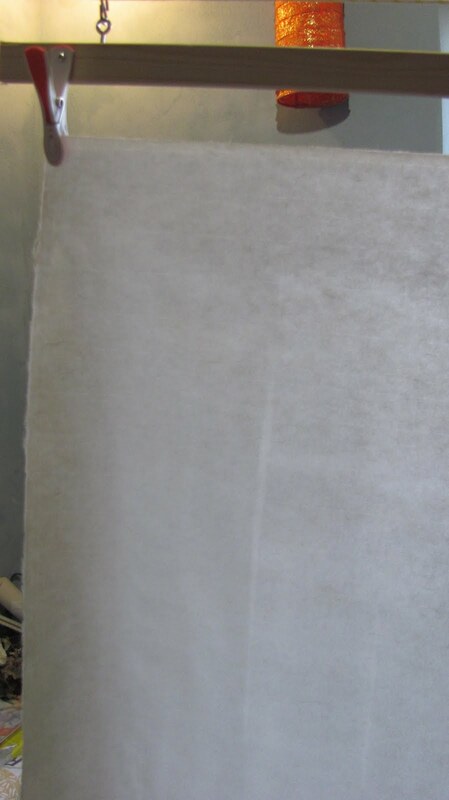 I hope to print a small image on my heavy sized paper (50g glue/25 alum) and light size (14g glue/5g alum) vs kinhada light, a professionally sized paper from Japan. I'm curious to see what happens. I am always amazed at how we printmakers make use of all available space. 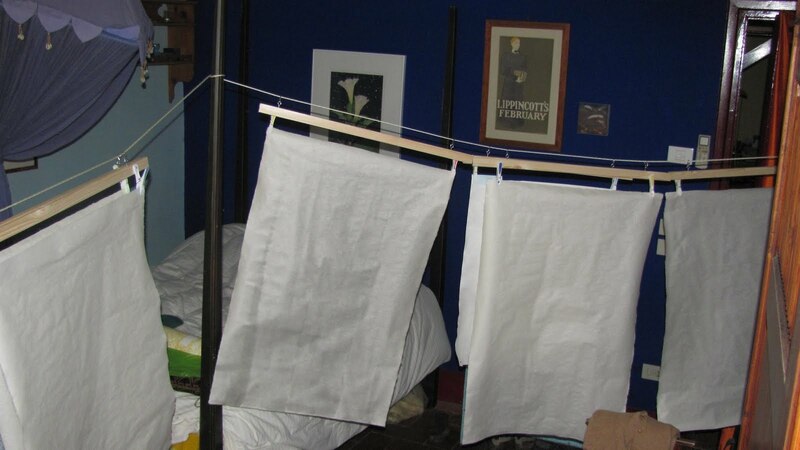 Love the use of the 4-poster for drying the paper. I started thinking about the brush strokes. Would a foam paint roller work? Or maybe a spray bottle and then brush it? Yes, I think a sprayer or even a roller would probably work.....and might be in my future. A printing trial first as if it prints well except for the brush strokes then fixing that will be a next step. If it looks uniformly terrible, well then a bigger brush might not be the answer. thanks a lot for sharing this, I think I'll wait a little more before starting sizing my own paper though.. but when (and if) I do I will definitely come back here to read everything again! Great post, thanks for sharing your results! You all seem to be expert papermakers here. What can i add to give strength and waterproofness to my paper? I want to make handmade paper beads but the paper i have made breaks as soon as i apply any tension and tears when wet from th glue. Only solution I have come up with is to seal it first which i am going to try with my next batch. Eryka. I am not a papermaker but buy already made paper which I am trying to reinforce with a mixture of alum (aluminum phosphate) and dissolved glue (rabbit skin). 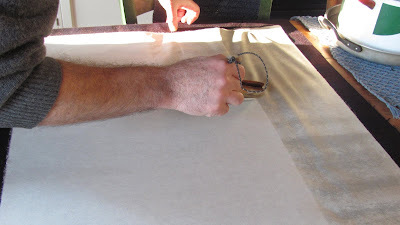 There are products the Japanese use to make the paper waterproof but you'd be better served trying to find out through someone who has made paper beads or paper-mache'. Good Luck.